Specialties - There are many other kinds of services we offer. There are many other kinds of services we offer. Below is a partial list of some of the other services with a brief description of each. This is a simple test that is sometimes requested or required by a city or an individual to determine, through the use of a special dye or other methods, if a house is connected to the city sewer. The way the test is done is to open the downstream manhole, typically in the street, and to then flush a special dye or other matter into a toilet and then observe if that special dye flows through the city sewer manhole. For certain reasons and at certain times a city inspector may want to observe the test to determine whether or not the house is connected to the sewer via this type of test. We have performed this type of test many times and we very familiar with the process involved. Percolation testing may be required in a number of different situations. For instance, when you are considering a purchase of vacant land, determining what the percolation rate may be on a lot, which has no sewer within 200-ft, is very important and may determine whether or not you can build a home on that property. When purchasing a home, it is also important to know if the existing PSDS is in good condition and functioning at a capacity that will support your family and its intended use. We are experts in this type of percolation testing and evaluation. We will provide you with a thorough and complete understanding of how well your system works and precise information on the rates of percolation and how that will impact your intended use. If you are considering an addition or remodel to your home and if that remodel includes more bedrooms, you will most likely need to either expand your existing system and or perform percolation testing for the addition. In some jurisdictions we are authorized to do the percolations testing for a new system. In some jurisdictions, we can refer you to a geologist who is authorized to do official percolation testing. Because many homeowners want to be “green friendly” and use their gray water to irrigate their landscaping instead of simply putting the water into a septic system or into the sewer, we can offer several options. There are very simple grey water systems and very high tech systems. We have many options available to you for many different types of systems. We also can repair and upgrade your grey water system. There are many new types of pipe available for these specialized systems. If you have any questions, or would like additional information, or would like to make an appointment to have a representative come to visit your site, please call us at 818-352-2253, or contact us. We will be happy to answer your questions, and email, fax, or mail you additional detailed information. What make us your first and best choice? Our six decades of experience, our rock solid reputation, and our proven expertise in sewer and septic system service. There are drip systems for irrigating landscaping that can be installed with OWTS that provide nitrogen rich water, which can be used to irrigate your landscaping. These systems are somewhat costly, but the long-term benefits in water savings are very rewarding. The water, or effluent for an OWTS is generally very clean and nitrogen rich. The grass or landscaping plants it irrigates will thrive and blossom. We have experience installing and repairing these drip systems. We would be happy to come and look at your home or help you determine if this system will work for your situation. The Pirana Aerobic Bacteria Generator, or Pirana, is a truly amazing solution for a failing private sewage disposal system. This unique device is specifically designed to recover lost percolation and improve the functioning of a septic system. The unique Pirana bacteria opens the pores of the soil surrounding a leach line or seepage pit, and over time, the water levels drop and the system functions normally. 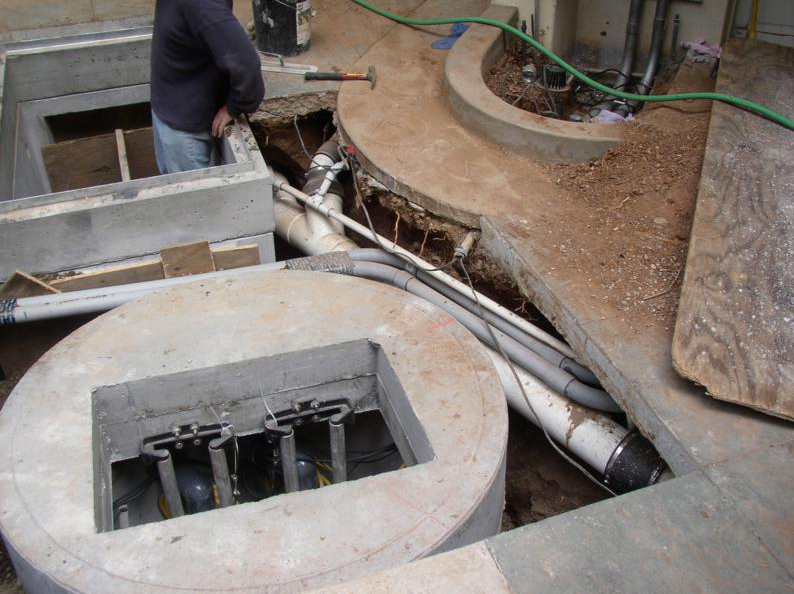 The installation of a Pirana is a relatively low cost solution which will help a homeowner avoid a very difficult and expensive new septic system installation. We have installed over 250 Piranas in the last 10-years with a very high success rate and many very happy Pirana customers! ProPump is a bacterial treatment system for PSDS manufactured by Ecological Laboratories Inc. It is an ecologically friendly bacteria treatment that can be applied to various parts of your PSDS. This product can improve the functioning of the system and remove offensive odors as well. We have offered this product for over two decades and have many long term and very satisfied customers. We can provide service for the application of this product into your PSDS. This product is a blend of live sulfur based bacteria in a liquid form that thrives in the septic system environment. The bacteria consumes some of the solid waste in the septic tank and then goes into the seepage pit or leach line and opens the pores of the soil to improve and maintain the percolation into the soil. We have had very good success with this well documented and tested product. We are Certified AdvanTex service providers. We service many homes in the Los Angeles County area. We have a proven track record of providing quality, customer friendly, service and maintenance to our AdvanTex customers for nearly two decades. 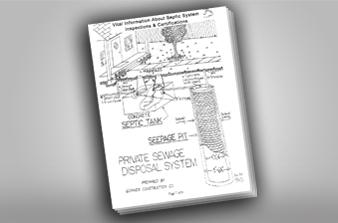 An introduction to Private Sewage Disposal Systems, 23 page guide booklet put together by Gopher Construction Company. Contact us for your own copy (818) 352-2253. Copyright © 2017 Gopher Construction. All Rights Reserved. Designed by Digital Orange Studio.